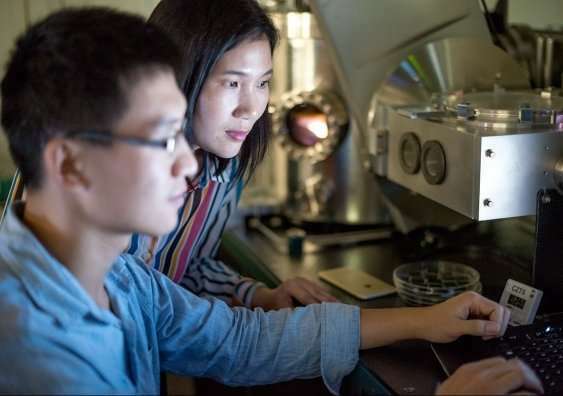 Dr. Hao and her team broke the 10 per cent efficiency barrier for not only sulfide kesterite but also for a standard sized kesterite solar cell, whether pure sulfide material or incorporating less-desirable selenium. The result, which is published in a paper in Nature Energy today, is the fourth consecutive efficiency record achieved by the group led by Dr. Hao in two years. Dr. Hao says that while the energy efficiency is not yet at a level that can be used in industry, the results are promising for a material that is abundant and cheap to procure. 'Sulfide kesterite is a compound made up of copper, zinc, tin and sulfur – four cheap and abundant elements in the Earth's crust," she says. "I call them green materials, because in addition to being abundant, they're also non-toxic." Sulfide kesterite (Cu2ZnSnS4, also referred to as CZTS) is a thin-film semiconductor material derived from photovoltaic (PV) material CIGS (copper indium gallium (di)selenide) which is a commercialised high efficiency thin-film PV technology that has the added advantage of being able to be applied to flexible surfaces. However, a drawback of CIGS is that indium is relatively rare and in high demand for use in flat panel displays (such as television screens, notebook screens, and touch screens), which means it is expensive. One of the challenges of solar cells is the reliance upon rare and toxic materials for use in thin-film solar cell production. "The price of indium is already high and expected to keep going up, because the market for flat panel displays is growing," Dr. Hao says. Enter CZTS. By replacing indium and gallium with the plentiful zinc and tin, you have a compound that fulfils the criteria of being low cost, flexible, non-toxic and abundant. "In addition to that, as a stand-alone thin-film PV, CZTS related material has a chance to be used in a tandem cell with silicon as its bandgap can be easily tuned over a wide range when alloying with other elements, making it well matched to the high bandgap requirements for the upper cells of tandem stacks," Dr. Hao explains. "The key prerequisite for such development is we need to get the efficiency of CZTS to beyond 20 per cent for us to see total energy efficiency of more than 30 per cent," Dr. Hao says. Another advantage to using sulfide kesterite is that manufacturing processes for CIGS are easily adaptable to producing CZTS. Adding the fact that the thin-film can be applied to flexible surfaces makes it an attractive alternative. "The flexible PV cells are lightweight, extending their potential use for building integration and on other uneven surfaces such as cars or unmanned air vehicles (UAVs)." So CZTS is cheap, abundantly sourced, flexible, non-toxic and easily integrated into existing manufacturing processes. Missing is the energy efficiency levels needed for the material to be used commercially. Given the advances in efficiency made in the past few years – from 7.6 per cent to 11 per cent – Dr. Hao believes she and her team are on the right track to achieving efficiency levels of 15 or 20 per cent. But she is under no illusion that it will happen overnight. "For each efficiency change, we need a step-change technology to make it happen," Dr. Hao says. "With CZTS, there are still so many things that we don't know. Unravelling these unknowns is the most exciting adventure." She is quite excited about recent unpublished findings which could bring significant changes. To ensure these new findings are developed further, she will be applying for funding for a new project at the end of the year. How many of these " break throughs" have we read about in the last 5 years? I can think of dozens and yet we are only at (some say) about 19% efficiency? Pretty sad. I understand a laboratory result does not turn into a field success but rarely. However, like I said I have read of dozens of theses and we are no further now than 8 years ago. Now wonder no one wants to use government subsidies for solar any more. @Porgie - the overall efficiency of natural photosynthesis is around 10%, despite almost 4 billion years of "breakthroughs" and stepwise improvements. It may not seem like it, but 19% efficiency is actually not bad. Particularly for a very inexpensive cell. Even the very best cells with very expensive materials, concentrators and coolers under laboratory conditions don't get much above 40%. This technology has really only been under development for 50 years or so, and the biggest sums and talent only in the last 30. Only from the perspective of a child, someone uneducated in science history, or the downright ignorant could not see the progress as phenomenal.